Onto the anime that first attracted Western audiences to the light novel. Normally I stick to written works, but I'm back in school, so I've thrown the D animations into my lineup. 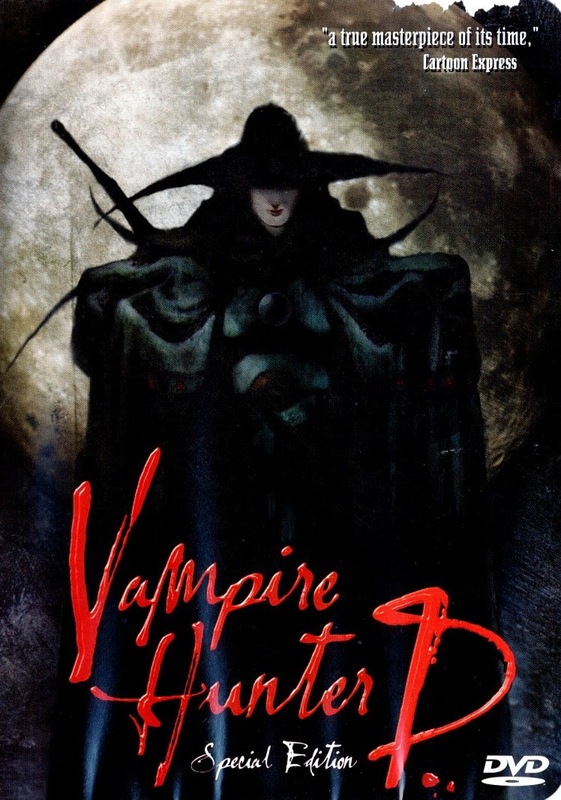 Vampire Hunter D (1985) is an Original Video Animation (OVA) directed by Ashida Toyoo, the man behind the gory Fist of the North Star animes. The fact that Doris is wearing a cross at the start tells readers of the novel that we've lost something. One of the cool things about the novel is how thoroughly it established the Nobility's control of humanity. With crosses everywhere, it takes away a unique element from the novel's mythology and indicates that this is going for a much more general base. At least Doris didn't strip in the first scene though she wears almost nothing (put on some pants or a least a longer skirt girl! ), and there is the requisite show scene. Ah, 80s anime, all the TnA and gore an adolescent boy could ever hope for. 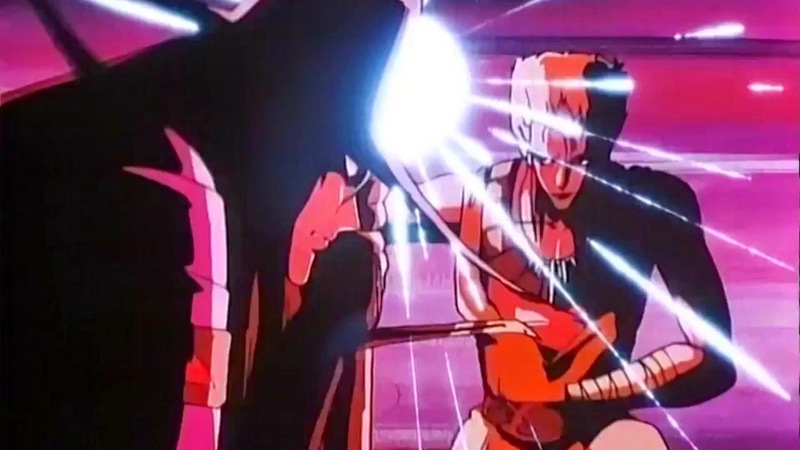 The OVA is essentially snippets of the novel barely merged into a barely coherent, poorly paced mess of a film. D is an unstoppable killing machine. With almost every problem, he hacks, bites, and slashes his way through it. It is very similar to the nigh invincible way he's portrayed later in the series. He also seems to have more control issues though that may result from the bizarre pacing of this OVA. Plus, D resisting his vampiric urges just looks like him... being a bit premature in response to Doris' advances. Doris herself gets far less less to do than the novel. She gets captured three times... She defeats zero villains... The way the story got blended and made more generic resulted in the absolute butchering of Doris' character. She becomes a generic 'save me' heroine. Lame. Dan is a badass?!? Seriously, he saves Doris twice and manages to sneak into the Count's castle at the end, somehow. His idolization of D is the thing that gets pretty much the only small moments as he gets advice from and imitates our hero. Rei Ginsei is the worst off of the main villains. He's been sort-of merged with Garou as Count Lee's main henchman, though Garou appears twice in wolf form before disappearing from the film. Rei Ginsei desires immortality and develops his rivalry with D; however, he is constantly whining and laughing. He screams for half a minute when D chops his hand off. Worst of all, he doesn't get killed by D.
Larmica is the same as in the novel. She's great, and I have no complaints. Count Magnus Lee's intro is awesome. Sufficiently seating him as a force to be reckoned with. There is some awkward imagery of him in his castle, but he mostly remains the same aside from doing a bit more. The ending is far better than the contrived pondering of D's origin from the novel. The count's castle gets a trippy endscene. Unfortunately, it is followed by an idyllic ending with happy music. What? This film has some solid 80s animeisms and will satisfy most viewers just looking for that, However, the plot and story are hacked up and reassembled with watered down characters. It has become so generic that it hurts, especially if you've read the novel. It's a cult classic and essential anime, but it's just not that good. However, it isn't terrible. I agree with DC; weird but not great.